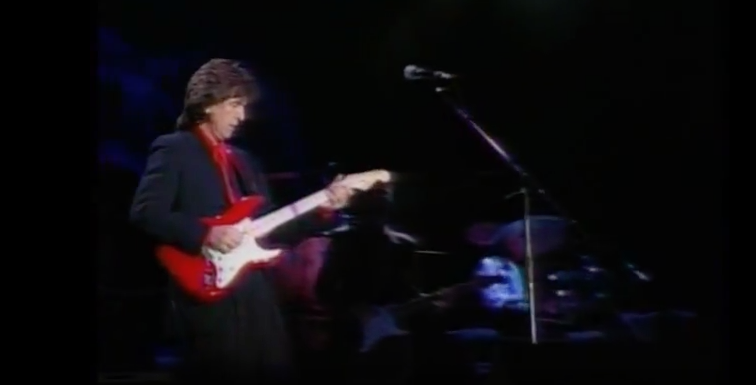 In December 1991, George Harrison and Eric Clapton played twelve concerts together in Japan. Incredibly this run of shows would make up Harrison’s last official tour (only giving a handful of live appearances following it) before his death in 2001. As a member of The Beatles he toured extensively right up until 1966, however as a solo artist, despite releasing twelve studio albums over his career, he only toured on two occasions; a major tour of the U.S in 1974 and the aforementioned ’91 Japan tour. In the clip below see his performance of “Cheer Down” from that tour, featuring an all-star band that includes; Eric Clapton and Andy Fairweather Low on guitars, plus Nathan East and Steve Ferrone providing bass and drums.